I have finally reached the last of my MTR line guides: the East Rail Line. 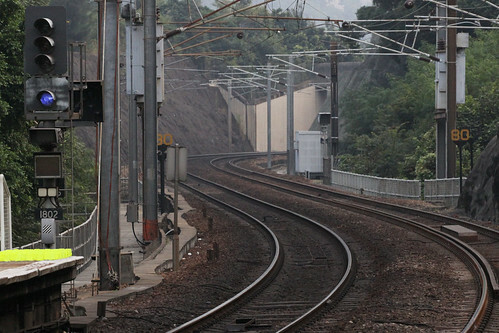 The line has the longest history of any railway in Hong Kong, and is also the most interesting for a railfan. The East Rail Line was the first railway in Hong Kong and opened in 1911 as the single track Kowloon-Canton Railway (KCR), which continued across the China border into what is now called Guangzhou Province. The Hong Kong section stretches 34 kilometres from urban Kowloon, under the Kowloon Hills into the New Territories, then along the shores of Tolo Harbour until the border crossing of Lo Lu is reached. The majority of track located at ground level, except for a few sections of tunnel through mountainous terrain. Operation of the KCR line followed British practices, with imported steam locomotives and safeworking equipment. Trains continued to cross the border until Communist China closed the border in 1949, suspending through train services until an improvement in international relations in 1979. Dieselisation of the KCR British Section commenced in 1955 with the purchase of two EMD locomotives from Clyde Engineering, with steam locomotives retired by the 1960s. 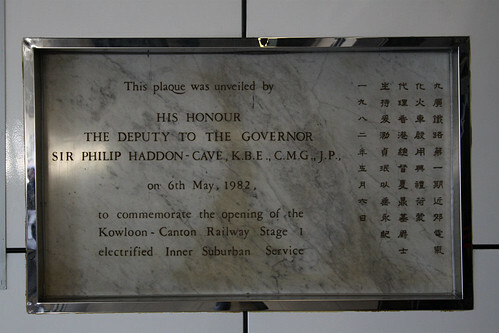 Further expansion of the railway followed in the early 1970s with a new city terminus built at Kowloon, and the purchase of additional diesel locomotives and carriages. Due to increased population growth in Hong Kong, in the late 1970s the Hong Kong government decided to build a number of satellite cities (“New Towns”) in the New Territories to relieve pressure on the existing urban areas. The areas selected included the villages of Sha Tin, Tai Po, Fanling and Sheung Shui; all located along the existing KCR route. To meet the transport needs of the New Towns, a modernisation scheme commenced to upgrade the railway to suburban standards. Completed by 1983, works included duplication of the track, installation of overhead electrification at 25 kV AC, the opening of new and rebuilt railway stations to serve the new housing developments, and a fleet of new EMUs to provide the passenger service. 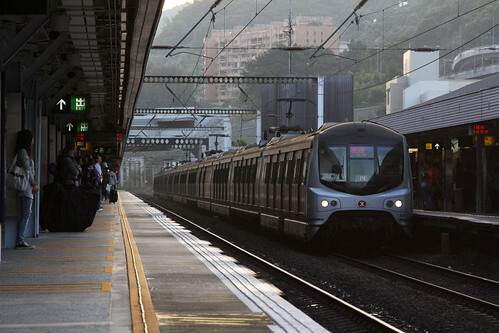 Today the 12-car long trains used to provide the MTR service are the longest in Hong Kong, with all other lines limited to 8-car long sets. 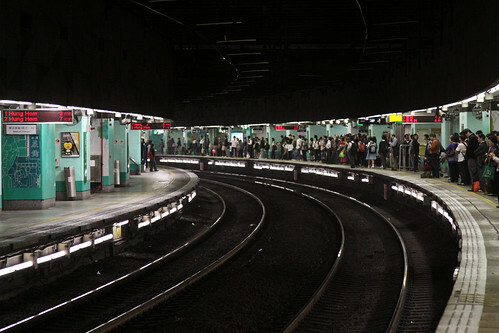 The stations along the line lack the platform screen doors seen on the rest of the MTR network, the sharp curves being a legacy of the original 1911 railway alignment. 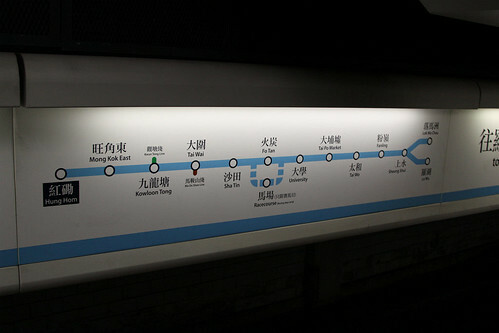 The East Rail Line has two termini at the northern end: the original border crossing at Lu Wu, as well as a more recent station at Lok Ma Chau that provides a second border crossing into China for passengers on foot. 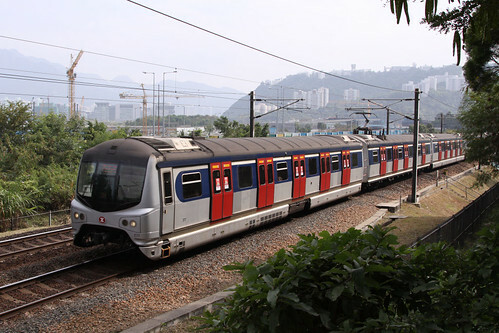 The route also has a loop line near Fo Tan, allowing trains to serve the Sha Tin Racecourse on race days. The MTR service has one feature that isn’t seen on many rapid transit services: one carriage per train is designated as first class. Provided you pay twice the normal fare, you get to sit on comfortable padded seats, instead being pressed up against other passengers in the aisleways of the other carriages, or freezing your backside on the metal bench seats. Another unique feature of the intensive metro service is what shares the tracks: locomotive hauled passenger trains. A dozen “Through Trains” cross the border into the southern Chinese province of Guangdong each day, as well as an overnight train continuing to the northern cities of Shanghai and Beijing. With the exception of one train set, locomotives and carriages for these passenger services are provided by China Railways. 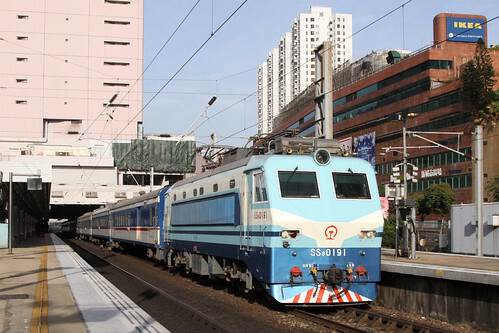 Rail freight also once shared the tracks, with a large freight yard at Hung Hom and Lu Wu, and smaller yards at Mong Kok, Sha Tin, and Fo Tan. 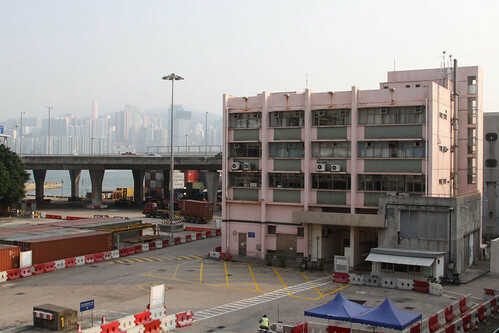 In later years freight traffic consisted solely of bulk mail, with the last train running to Hung Hom in June 2010. Container traffic had declined with improvements to port infrastructure in China, and live pig traffic ended with the opening of the Sheung Shui Slaughterhouse near the China border in 2000. The freight yards remain in place for now. 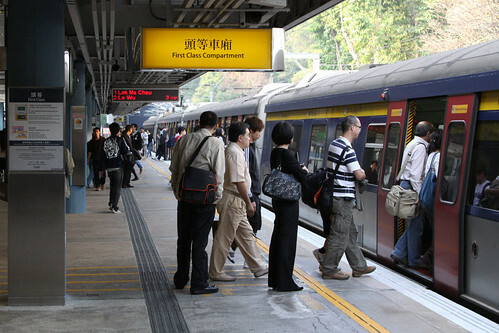 To allow the use of mainline trains on the line, full lineside signalling is installed along the route, the only installation in Hong Kong. Signals are of British four-aspect design, with red / yellow / double yellow / green lamps indicating “stop” / “caution” / “preliminary caution” / “clear” aspects. Train protection was originally provided with the use of AWS (again from Britain) but to cater for increased traffic levels the Belgium TBL (Transmission Beacon Locomotive) ATP / ATO system was installed in the late 1990s, along with a special blue signal aspect. Coming up soon: some more detailed posts about what I have touched upon today. I need to post these 300 odd photos somewhere. Now do you see why I said the East Rail line was the most interesting railway in Hong Kong? This entry was posted in MTR line guides, Transport and tagged East Rail, Hong Kong, KCR, Kowloon Canton Railway, Mass Transit Railway, MTR, New Territories, railway, trains. Bookmark the permalink.